It has been nearly a month since my last post; time flies when you are busy. My last post was on the various ways for people to learn about emotional intelligence. Emotional intelligence expert and fellow blogger Galba Bright and I have been discussing these topics since the article Beyond the Hype was published in the PM Network magazine. Galba articulated his thoughts on books, learning programmes, and coaching in his series of related posts. 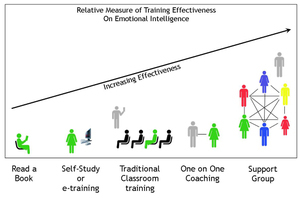 While not nearly as articulate or persuasive as Galba’s posts, my own post featured this nifty graphic showing what I believe to be the increasing utility of various learning modes for emotional intelligence. I also promised in that last post to talk about my own learning experience and the process I went through. I learned primarily through group therapy. The particular group I was involved in was an assignment group at the Center for Life Enrichment, a Christian based counseling center. Here is how the assignment group worked. You met for 90 minutes each week with the same group of 10 people. Each group was facilitated by one or two trained therapists. Each group member had a series of assignments to complete. There were many different assignments and they were all intended to get us to better understand our feelings, make ourselves more self-aware, heal relationship issues from our families of origin, and help us to develop strong relationships with others. Outside of the weekly group meeting, we were expected to stay in relationship with the people in the group. This meant frequent phone calls to check in with people and stay current with them. It was pretty intense and time consuming. One of the major outcomes of the group process was that each group member received a lot of feedback from the other members. Each person had 10 or so other people – men and women – to react to them and to work out relationship issues. Each person was responsible for telling the truth about how they saw and experienced the other group members. It was like a safe playground to experience emotions and learn about relationships. It was scary, exciting, fun, and incredibly satisfying! I think the reason that the group learning process worked so well for me was largely because of my lack of self-awareness. I wasn’t in touch with my emotions and I wasn’t aware of how others experienced me. I quickly learned! In fact, I received plenty of feedback on how I impacted others, my lack of empathy, and my biases and filters. The value of the group is that everyone tells the truth. When others react to you, they let you know it. When you hurt or offend them, they tell you. Which is why I think that learning in a support group has a slight advantage over one-on-one coaching. With groups, you get input and relationships with many people, not just one. Everyone in the group becomes a potential teacher. They are a peer to you, and they don’t have to worry about you getting upset or cancelling the relationship with you as a coach might. In addition to the assignment group, I also experienced the group process on about 10 retreats over the last 6 years. I also joined a men’s group after leaving the assignment group last year. In the men’s group, we focus on being good leaders at work as well as being good husbands and fathers at home. I should point out that I have been seeing a coach throughout the time I have been involved in support groups and that has been invaluable. I met pretty much every other week with him for an hour. I have also read 12 to 15 books on emotional intelligence and that has helped to round out my learning. I am a big believer in the group approach to learning, in particular when it comes to emotional intelligence. I have incorportated this model into my own workshops so that people learn from each other and begin to see themselves as others do. As always, I’d love to hear your thoughts on the topic.